So, I love beholders and have decided to do my own. I thought I'd share this journey with you here, because I like to spread the pain around. Actually, I'm hoping to get good feed back as to what I am doing right and wrong. So, I came up with the following concept sketch. 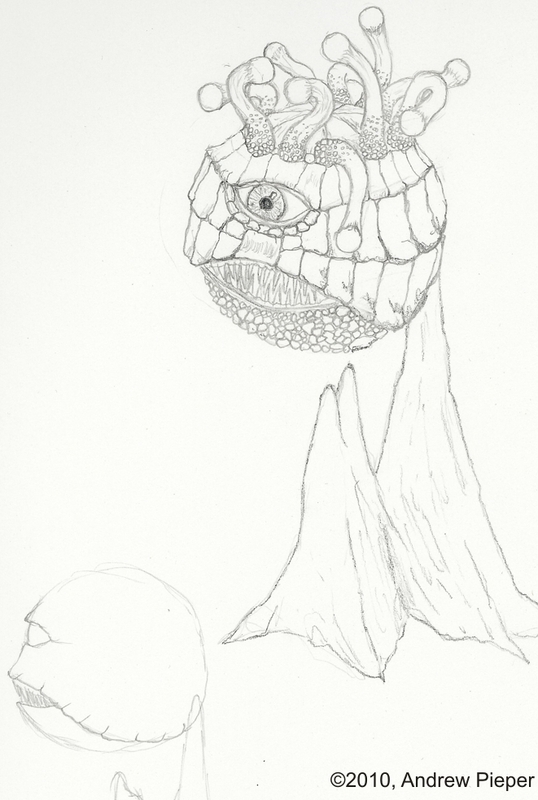 The beholder is floating by a stalagmite and is just brushing up against it. 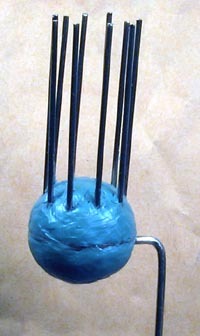 I've assembled my armature already and should have pictures of that in a few days, as time permits. I made it by drilling 10 small holes, evenly spaced, around the rim of a worn-out penny. I also drilled a larger hole in the center. 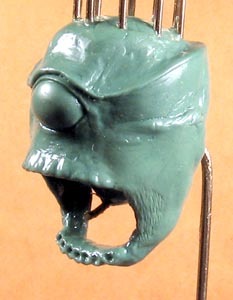 The beholder will be about 32mm in diameter. The penny is just under 3/4 of that. I soldered 10 brass wires, 1-1/2 inches long each, into the holes of the penny (note that soldering on a penny is not easy). 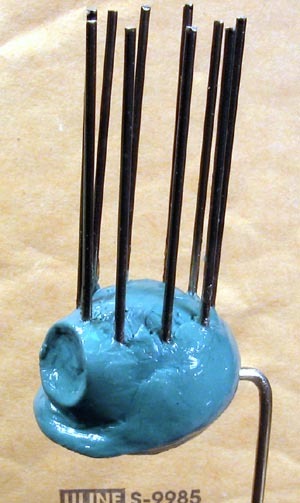 I then bent to shape and soldered the main support rod into the center of the penny. This rod will eventually be the center of the stalagmite. Next, I'll start building up the underpinning for the skeletal structure. It will be cool to see this shape up. On the artwork the eye stalks seem short to me. Will they be longer on the actual miniature? I've been thinking of doing a wip on a figure I want to sculpt to keep me motivated so I may blatantly copy you and do one of my own. On the artwork the eye stalks seem short to me. Will they be longer on the actual miniature? 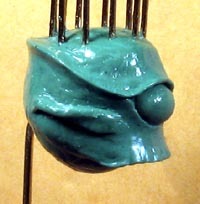 Yes, by about an 1/8 as you can see in the really long armature ones (though some of that will be covered by the body). I decided that after the fact. I may actually make a few more drawings before I get to sculpting the detail. 1: I have the shape wrong and I need to investigate the underlying anatomy better than I did. 2: What I drew is way too heavily armored. First off, why all the armor; it is mostly just covering bone. Second, all that added weight would just add to the amount that the creature needs to levitate. 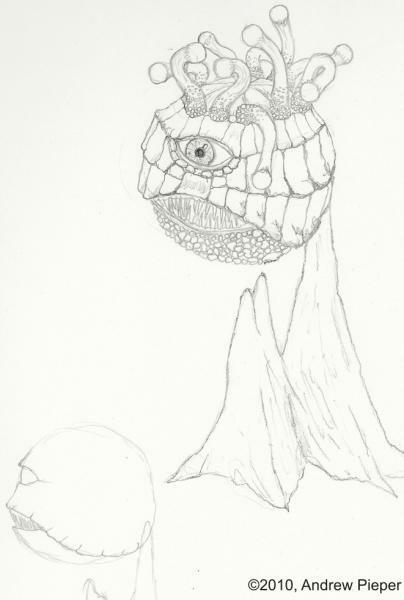 So, I am starting over by defining the skeletal structure of a beholder (IMO), see the attached. Let me know if you see anything totally out of place or that would be better if I tweaked something one way or the other. Note, this picture was edited to reflect changes suggested by a friend that I reall liked. I think I am getting close now. OK, after much wrangling and work on anatomy, here's the final internal anatomy. 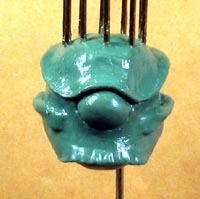 I added the dual sagital crest for the jaw muscles to attach to. Red is muscles, black is bone outline, and brown is connective tissue/other. I only drew in one tentacle and it is not in the position it will be in in the final piece. So, now I have to figure out the external anatomy and the pose. Then, tonight, I started adding bulk to the skull. Please note that this will be getting larger and nothing you see at this stage will be visible in the final mini. This is all just to build structure and shape, a bit at a time. 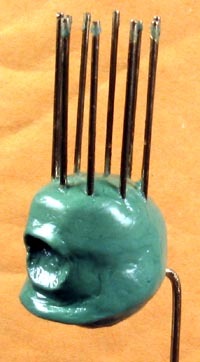 I spent a lot of time tonight just playing with my sculpting tools and figuring out what each is good for. The clay shapers especially took some getting used to. Well, this weekend I was able to put more time into the sculpt. First, I bulked up the upper eye socket and added the dome of the skull. 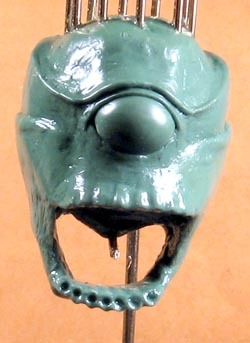 Then I sculpted the lower eye socket as far out at is will be going and then added the upper jaw, complete with tooth sockets. 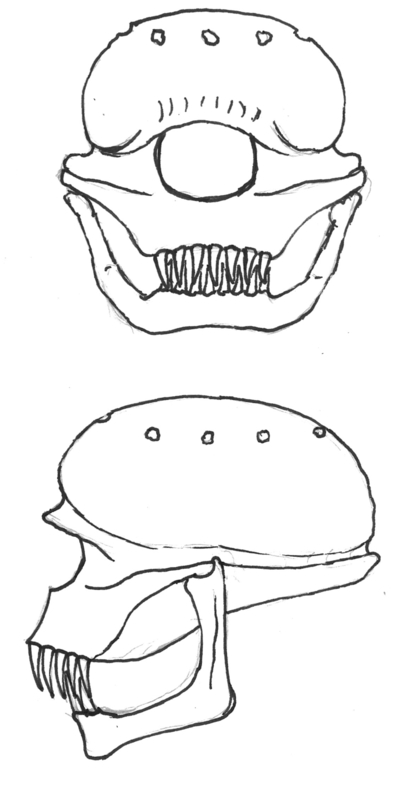 The skull of the lower eye and upper jaw is now done. Next, I'll add the eye, brow ridge, and sagital crests, bulking out the rear of the skull some more as I do. 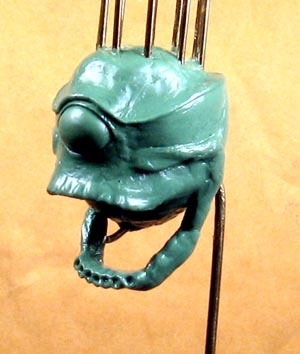 A concern I'm having is that bending the eye stalk armature to natural positions might deform the greenstuff body. Yeah, I thought of that too, but it has set up very hard. Further, I intend to bend them before the final skin goes on, so hopefully I can adjust then if needed. In the past few days, I added the eyeball, the zygomatic (cheek) bones, and the brow ridge/sagital crests. The upper skull is now finished, save for the teeth. Now I have to add the lower jaw and then start adding muscle and flesh to it. Looks better than mine, so far. 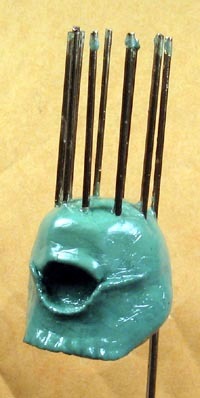 This week, mostly between other projects like my WAMP Ironwind Metals competition entry, I sculpted a fair bit. 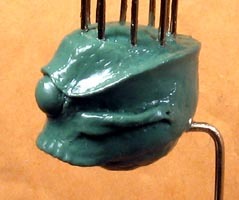 I added an upper eyelid, made an armature for and sculpted the lower jaw, added the armature for the tongue, and sculpted the muscles of the head and jaw, adding the stretched cheeks which will be visible. The first picture is with the jaw and eye lid on. The second two are after I added the muscles and cheeks. I'm cheering on anyone with the cojones to do sculpting. This is looking good. Great WIP thread for those of us who've always wanted to try our hand at sculpting.